Protection of Trade Secrets by Law Firms, Federal Bar Council Quarterly, Sept./Oct./Nov. 2018, at 10. Some Lessons From the Waymo (Alphabet) Versus Uber Theft of Trade Secret Litigation, February 14, 2018, (http://www.ipwatchdog.com/2018/02/14/waymo-uber-theft-trade-secret-litigation/id=93528/). Trump Campaign Officials Likely Violated the CFAA, Law360, November 15, 2017 (https://www.law360.com/articles/985452/trump-campaign-officials-likely-violated-cfaa). Who Will Rescue The U.S. Patent System? Law360, September 28, 2017 (https://www.law360.com/ip/articles/968560/who-will-rescue-the-us-patent-system-). Computer Fraud and Abuse Act, GPSolo, ABA Solo, Small Firm and General Practice Section, September/October 2017 (Selected as Best of ABA Sections). Available Remedies under the DTSA, IPWatchdog, July 18, 2016 (http:// http://www.ipwatchdog.com/2016/07/18/available-remedies-dtsa/id=70899/). Handle with Care: Civil Seizure Under the Defend Trade Secrets Act, IP Watchdog, July 5, 2016 (http://www.ipwatchdog.com/2016/07/05/handle-care-civil-seizure-defend-trade-secrets-act/id=70438/). Misappropriation of a Trade Secret Under the DTSA, IPWatchdog, June 10, 2016 (http://www.ipwatchdog.com/2016/06/10/misappropriation-trade-secret-dtsa/id=69826/). Definition of a ‘Trade Secret’ Under the DTSA, IPWatchdog, May 24, 2016, (http://www.ipwatchdog.com/2016/05/24/defintion-trade-secret-dtsa/id=69262/). Five Things to Know About the Defend Trade Secrets Act, IPWatchdog, May 11, 2016 (http://www.ipwatchdog.com/2016/05/11/five-things-know-defend-trade-secrets-act/id=68954/). 2016 Marks 30th Anniversary of CFAA – Time for a Change, Law360, January 3, 2016 (http://www.law360.com/ip/articles/739442/2016-marks-30th-anniversary-of-cfaa-time-for-a-change). Supreme Court needs to clarify the scope of the CFAA, The Hill-Congress Blog, December 24, 2015 (http://thehill.com/blogs/congress-blog/judicial/264061-supreme-court-needs-to-clarify-the-scope-of-the-cfaa). Not all Chinese are economic spies, The Hill, September 28, 2015 (http://thehill.com/blogs/congress-blog/judicial/255036-not-all-chinese-are-economic-spies). How my family recovered a painting stolen by the Nazis and sold it for $2.9 million, Yahoo Finance, July 7, 2015 (http://finance.yahoo.com/news/how-my-family-recovered-a-painting-stolen-by-the-nazis-and-sold-it-for--2-9-million). NSA Encryption and Big Data, Reuters, June 28, 2015 (http://www.legalcurrent.com/nsa-encryption-and-big-data/). The anti-innovation Patent Act of 2015, The Hill, June 22, 2015 (http://thehill.com/blogs/congress-blog/technology/245544-the-anti-innovation-patent-act-of-2015). The St. Louis ‘Jailbirds,’ Yahoo Finance, June 19, 2015, (//news.yahoo.com/the-st--louis--jailbirds-181428689.html). A more draconian computer fraud act? Los Angeles and San Francisco Daily Journal, January 29, 2015. The Administration’s Misguided Proposal to Amend the CFAA, Law360, January 16, 2015. Sony hack lessons: don’t react, Los Angeles and San Francisco Daily Journal, Dec. 24, 2014. The ‘dirtboxes’ of the U.S. Marshals Service, The Hill, Dec. 12, 2014, http://thehill.com/blogs/congress-blog/judicial/226823-the-dirtboxes-of-the-us-marshals-service. The Legality of the U.S. Marshals Service’s Use of “Dirtboxes” To Collect Information, Los Angeles and San Francisco Daily Journal, Dec. 2, 2014. Congress drags feet as hackers run amuck, Los Angeles and San Francisco Daily Journal, Oct. 22, 2014. The assault on the patent system, Washington Business Journal, August 29, 2014. It’s time to repeal and replace the outdated ECPA, Los Angeles and San Francisco Daily Journal, September 18, 2014. Trade Secrets: IP of the 21st Century? Los Angeles and San Francisco Daily Journal, August 21, 2014. The Government vs. General Alexander: Who Owns His Inventions, IP Watchdog, August 18, 2014 (http://www.ipwatchdog.com/2014/08/17/the-government-vs-general-alexander-who-owns-his-inventions/id=50816/). The Assault on Patents, The Hill, Congress Blog, August 13, 2014 (http://thehill.com/blogs/congress-blog/judicial/214943-the-assault-on-patents). The multi-front war on patents, Los Angeles and San Francisco Daily Journal, July 17, 2014. John Q. Internet User: HACKER, FELON, Los Angeles and San Francisco Daily Journal, June 20, 2014. Cyber and Internet Crime: An Overview of Procedural and Substantive Issues, Bloomberg BNA, 2014.
Who really won Apple v. Samsung redux? Los Angeles and San Francisco Daily Journal, May 28, 2014.
Who You Calling a ‘Patent Troll’? Term is Overused, Harm Overblown, National Law Journal, March 17, 2014. Trade Secret Misappropriation Before the ITC, IP Today, July 2013. Should Lying About Your Age Online Be a Federal Crime? Corporate Counsel, May 2, 2013 (http://www.law.com/corporatecounsel/PubArticleCC.jsp?id=1202598332795&Should_Lying_About_Your_Age_Online_Be_a_Federal_Crime), also published in Internet Law & Strategy, June 2013. Amending the Computer Fraud and Abuse Act, Bloomberg BNA Electronic Commerce & Law Report, Vol 18. No. 15, page 695 (April 10, 2013), also published In Bloomberg BNA Criminal Law Report and Privacy & Security Law Reporter. Trade Secret Misappropriation Before the ITC, IPFrontline.com, March 11, 2013. How Congress Can Create A Lasting Legacy For Aaron Swartz, Forbes, February 15, 2013 (http://www.forbes.com/sites/ciocentral/2013/02/15/how-congress-can-create-a-lasting-legacy-for-aaron-swartz/). The Opposite of Poverty, USF Lawyer, (Fall 2012). “AN ANALYSIS OF ECONOMIC ESPIONAGE ACT PROSECUTIONS: WHAT COMPANIES CAN LEARN FROM IT AND WHAT THE GOVERNMENT SHOULD BE DOING ABOUT IT! “, BNA’s Patent, Trademark & Copyright Journal, Vol. 84, No. 2081, page 894 (September 21, 2012). “A LOOK AT 16 YEARS OF EEA PROSECUTIONS,” Law360, September 19, 2012. “APPLE-SAMSUNG JURY MAY JUST EYEBALL THE DEVICES TO REACH A VERDICT,” August 6, 2012 (http://venturebeat.com/2012/08/06/apple-samsung-jury-may-just-eyeball-the-devices-to-reach-a-verdict/). “THE RISKS POSED BY COUNTERFEIT ELECTRONIC PARTS,” Forbes, July 11, 2012 (http://www.forbes.com/sites/ciocentral/2012/07/11/the-serious-risks-from-counterfeit-electronic-parts/). “DISCLOSING CYBERSECURITY INCIDENTS: THE SECE WEIGHS IN,” Forbes, June 4, 2012 (http://www.forbes.com/sites/ciocentral/2012/06/04/disclosing-cyber-security-incidents-the-sec-weighs-in/). “FOUR LESSONS EVERY COMPANY NEEDS TO KNOW ABOUT PROTECTING IT’S TRADE SECRETS,” Westlaw Journal Intellectual Property, May 3, 2012. “CHINESE ESPIONAGE: THE RISKS WITHIN U.S. COMPANIES,” Forbes, April 24, 2012. “ALEYNIKOV AND NOSAL–2 MAJOR GOVERNMENT SETBACKS,” Law 360, April 24, 2012. “LIMITING THE SCOPE OF THE EEA: U.S. v. ALEYNIKOV,” Law360, February 27, 2012. “THE RISE OF CELL PHONE HACKING: OH, TO BE YOUNG, PRETTY AND A HOLLYWOOD SUPERSTAR,” Daily Journal, October 4, 2011. “HOW PRIVATE ARE YOUR PRIVATE POSTS,” Law360, September 28, 2011. “SOCIAL MEDIA WORLD, PROTECTING YOUR TRADE SECRETS,” Washington Business Journal, May 6, 2011. “COMPUTER FRAUD ACT AIDS IN TRADE SECRET PROTECTION,” New York Law Journal, May 13, 2010. “THE TREATMENT OF INTELLECTUAL PROPERTY UNDER BANKRUPTCY LAW,” The Bankruptcy Strategist, February 2010. “’UNAUTHORIZED ACCESS’ UNDER THE CFAA,” Law360, January 11, 2010. “THE INTERSECTION OF INTELLECTUAL PROPERTY AND BANKRUPTCY LAW,” Patent, Trademark & Copyright, BNA, June 12, 2009 (Winner 2010 Burton Award for Excellence in Legal Writing). “THE INTERSECTION OF INTELLECTUAL PROPERTY AND BANKRUPTCY LAW,” Law360, February, 2009. “EXPLORING THE LAW OF EMBODIMENTS AFTER PHILLIPS,” Patent Strategy & Management, Volume 7, No. 7, December 2006. “FEDERAL CIRCUIT FINALLY DEFINES MATERIALITY FOR INEQUITABLE CONDUCT,” Patent Strategy & Management, Volume 6, No. 11, April 2006. “DIAMONDS AND SPIDERS ARE COMING TO AN EXCHANGE NEAR YOU,” Futures & Derivatives Law Report, January 2006, Vol. 26 No. 1. “THE ADVANTAGES OF LITIGATING PATENT INFRINGEMENT LAWSUITS IN THE ITC,” Patent Strategy & Management, Volume 6, No. 2, June 2005. “COMPREHENSIVE PROTECTION OF NEW INTELLECTUAL PROPERTY,” Competitive Intelligence Magazine, May/June 2005. “LIMITING COMPUTER CRIME LOSSES WITH CYBERINSURANCE,” Internet Law & Strategy, Vol. 2, No. 7, July 2004. “LIMITING COMPUTER CRIME LOSSES WITH CYBERINSURANCE,” New York Law Journal, October 27, 2003, at T-5. Book review, “THE ART OF DECEPTION: CONTROLLING THE HUMAN ELEMENT OF SECURITY,” Kevin D. Mitnick and William L. Simon, New York Law Journal, February 4, 2003 at 2. “THE RIGHT TO A FAIR USE DEFENSE UNDER THE DMCA,” E-Commerce Law, Vol. 2, No. 9, September 2002. “THE REWARDS AND RISKS OF DEFENSIVE PATENT PUBLICATIONS,” E-Commerce Law, Vol. 2, No. 7, June/July 2002. “CONTROLLING SPAM,” E-Commerce Law, Vol. 2, No. 6, May 2002. Book review, “HANDBOOK OF COMPUTER CRIME INVESTIGATION,” Eoghan Casey, ed. New York Law Journal, April 2, 2002 at 2. “USING TECHNOLOGY TO LIMIT THE BASIS FOR JURISDICTION,” E-Commerce Law, Vol. 2, No. 5, April 2002. “DOES THE DMCA THREATEN FREE SPEECH,” E-Commerce Law, Vol. 2, No. 4, March 2002. “NO NEW ENCRYPTION LAW, AT LEAST FOR NOW,” E-Commerce Law, Vol. 2, No. 3, February 2002. “LIABILITY FOR COMPUTER INTRUSIONS AND DENIAL OF SERVICE ATTACKS: WHO SHOULD PAY?” E-Commerce Law, Vol. 2, No. 2, January 2002. “IS COPYRIGHT LAW OUT OF BALANCE?,” E-Commerce Law, Vol. 1, No. 10, October 2001. “IS P3P THE ANSWER?” E-Commerce Law, Vol. 1. No. 9, September 2001. “TRADE SECRET THEFT IN U.S. GETS SERIOUS,” New York Law Journal, June 9, 2001. “THE POTENTIAL IMPACT OF TRUSTED SYSTEMS ON COPYRIGHT LAW,” E-Commerce Law, Vol. 1, No. 7, July 2001. “DOES STRICT SCRUTINY APPLY TO COMPUTER CODE,” E-Commerce Law, Vol. 1, No. 6, June 2001. “MORE LIMITS ON DATA MINING,” E-Commerce Law, Vol. 1. No. 5, May 2001. “VIVE LA FRANCE,” E-Commerce Law, Vol. 1, No. 4, April 2001. “YOURCOMPANYSUCKS.COM,” E-Commerce Law, Vol. 1. No. 3, March 2001. 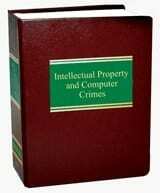 “CRIMINAL PROSECUTIONS UNDER THE DIGITAL MILLENNIUM COPYRIGHT ACT (DMCA),” eIP, Premier Issue. Book Review, “LASER: THE INVENTOR, THE NOBEL LAUREATE & THE THIRTY-YEAR PATENT WAR,” New York Law Journal, February 9, 2001, at 2. “IS DATA ON THE INTERNET PROPERTY?” E-Commerce Law, Vol. 1, No. 2, January February 2001. “AN IDEA WHOSE TIME HAS COME: PATENTING SOFTWARE AND BUSINESS METHODS,” Business Law Today (The magazine of the ABA Section of Business Law), Vol. 10, Number 3, January/February 2001. “THE LEGALITY OF HYPERLINKING,” E-Commerce Law, November/December 2000. “SOFTWARE AND BUSINESS METHODS ARE PATENTABLE IN THE US (GET OVER IT),” Patent World, September 2000. “PATENT PROBLEMS? THE SOLUTION . . .” Corporate Counsel, September 2000. “PROTECTING INVENTIONS AS TRADE SECRETS WHEN PATENTS ARE INAPPROPRIATE,” Patent Strategy & Management, August 2000. “ANTITRUST CONSIDERATIONS IN PATENT LICENSES,” International Legal Strategy, Vol. IX-7 (July 2000) (Japanese language publication). “PROTECTING INVENTIONS AS TRADE SECRETS: A BETTER WAY WHEN PATENTS ARE INAPPROPRIATE, UNAVAILABLE,” IP Law Weekly, May 24, 2000, at 664. “ANTICYBERSQUATTING CONSUMER PROTECTION ACT,” Intellectual Property Today, April 2000. “PROTECTING PREVAILING INTELLECTUAL PROPERTY,” The New York Law Journal, March 27, 2000, at S8. “INTELLECTUAL PROPERTY DUE DILIGENCE IN THE ACQUISITION OF OR INVESTMENT IN TECHNOLOGY COMPANIES,” The Lawyer’s Brief, Vol. 30 Issue No. 5, March 15, 2000; “Corporate Counsel’s Guide to Acquisitions and Divestitures,” April 2000. “THE IMPORTANCE OF PRIOR ART DISCLOSURE IN BUSINESS METHOD PATENT APPLICATIONS,” International Legal Strategy, Vol. IX-1 (Japanese language publication). “WIRTSCHAFTSSPIONAGE KANN IN AMERIKA HARTE STRAFEN NACH SICH ZIEHEN,” Frankfurter Allgemeine, at Seite 22, September 3, 1999 (German language publication). “FEDERAL PROSECUTION OF THEFTS OF TRADE SECRETS UNDER THE ECONOMIC ESPIONAGE ACT,” Worldwide Trade Secrets Law Treatise, West Publishing Company, Release No. 6, 1999. “STEAL BEAM – Has the Economic Espionage Act fulfilled its promise to protect trade secrets?” The Daily Journal, Intellectual Property Supplement, February 8, 1999. “THE CRIMINALIZATION OF TRADEMARK COUNTERFEITING ,” 31 U. Conn. L. Rev. 1 (Fall 1998). “SUPPLEMENT TO FEDERAL GUIDELINES FOR SEARCHING AND SEIZING COMPUTERS,” United States Department of Justice, October 1997. “EEA VIOLATIONS COULD TRIGGER CRIMINAL SANCTIONS,” The National Law Journal, August 25, 1997, at B8. “FEDERAL PROSECUTION OF VIOLATIONS OF INTELLECTUAL PROPERTY RIGHTS (Copyrights, Trademarks, and Trade Secrets),” United States Department of Justice, May 1997. “UNDERSTANDING THE ECONOMIC ESPIONAGE ACT OF 1996,” 5 Texas Intellectual Property Law Journals 177, Winter 1997. “INTERNET: A SAFE HAVEN FOR INFORMATION THIEVES,” 11 St. John’s J. Legal Comment 647, summer 1996. “THE PROSECUTION OF THEFT OF TRADE SECRETS UNDER FEDERAL LAW,” 22 Pepperdine Law Review 1, December 1994. (Cited in Senate Report No. 104-359, 104th Cong. 2nd Sess. 1996, accompanying S. 1556, THE INDUSTRIAL ESPIONAGE ACT OF 1996) (Reprinted in Protecting Confidential Business Information, Law Journal Seminars-Press, April 1996). Comment, “THE ADJUDICATION OF INDIAN WATER RIGHTS IN STATE COURTS,” 19 U.S.F.L. Rev. 1, Fall 1984.